On the mid-night of Bhadra Krishna Astami lord Krishna was born. To celebrate his birthday, Hindu devotees visit Krishna temples all over the world. Krishna is believed to have born towards the end of Dwapar era, the third of the four ages according to Hindu mythology. 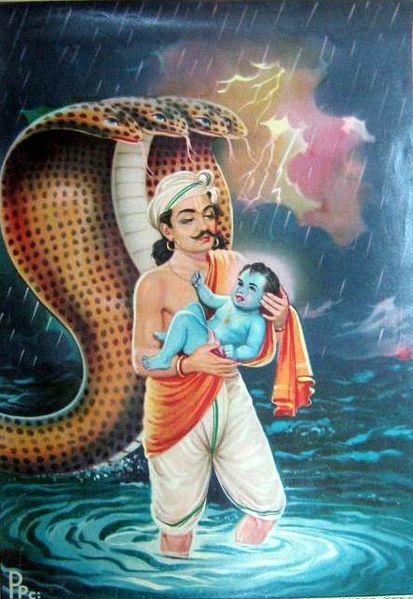 Krishna is the 8th incarnation of lord Vishnu as a human. He is believed to have born to destroy the bad people and save the good ones. Krishna was the eighth child of his father Basudev and mother Devaki. But, Devaki’s brother, Kamsa, had killed 6 children of his sister in fear of being killed by one of them. The 7th child, Balarama, appeared as a miscarriage and was transferred to Rohini’s womb. After Devaki gave birth to the 8th child, Krishna, the baby was switched with Yashoda’s daughter Ekanamsha (an incarnation of Yoganidra/Maya) by his fatehr Basudev in hope that Kamsa won’t kill a girl child. Despite protest from his sister Kamsa hurls her on a rock. But, the little girl transforms into an eight-armed goddess and told Kamsa, “Fool, your destroyer has already been born elsewhere,” and she vanished into the heavens. Devaki’s six dead sons were named Kírttimat, Sushena, Udayin, Bhadrasena, Rijudasa, and Bhadradeha. After quelling several assassination attempts by Kamsa, Krishna returned to his maternal uncle’s palace to overthrow and kill him in his youth. He reinstates Kamsa’s father, Ugrasena, as the king of the Yadavas and became a leading prince at the court. His parents were kept in the captivity of Kamsa until he rescued them. The legends of Krishna’s youth describe him as a cow herder, a mischievous boy. He is also portrayed as an enchanter and playful lover of the gopinis (milkmaids) of Vrindavana, especially Radha. These metaphor-filled love stories are known as the Rasa lila. Krishna’s interaction with the gopis at the rasa dance or Rasa-lila is an example of the concept of lila – playing for fun and enjoyment and not for sport or gain. 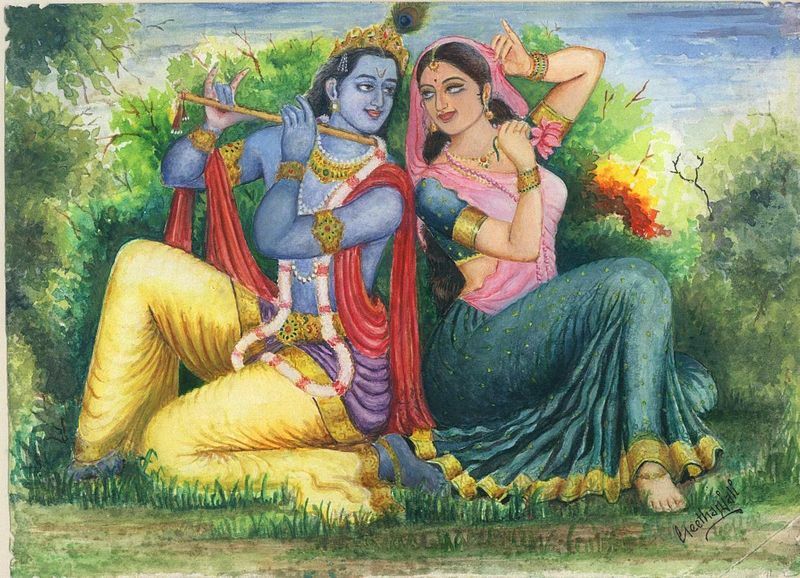 When Krishna played his flute, the gopinis were attracted towards him, from whatever they were doing and join him in singing and dancing. Those who could not join him physically, would join him through meditation. Krishna’s playfulness is celebrated during the festivals as Rasa-lila and Janmashtami. 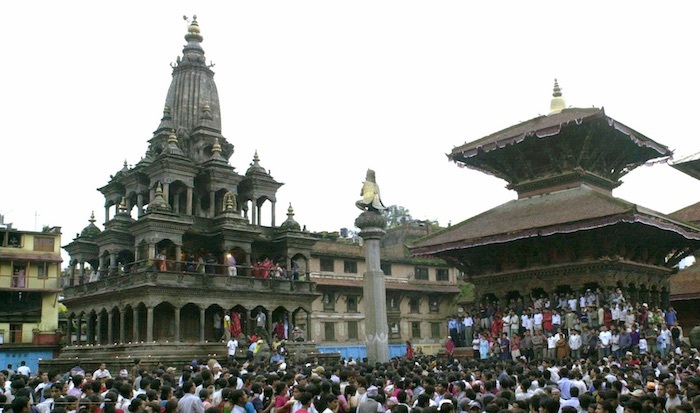 Photo – Crowd at Krishna mandir in Patan on Krishna Janmastami festival on August 14, 2017.